Losing a pet is easier than you may realize – 1 in 3 pets goes missing during its lifetime. And over 90% of pets without identification are never reunited with their owners. Microchipping is a simple procedure which creates a permanent form of identification should your pet become lost or stolen. The microchip is inserted with a simple injection, not unlike the pet receiving a vaccination. The pet’s unique ID code and your contact information is registered. Should your pet be taken to an animal shelter or clinic, the staff will scan for a microchip and contact the appropriate registry. Once your information is retrieved, you will be contacted to arrange a reunion with your pet. 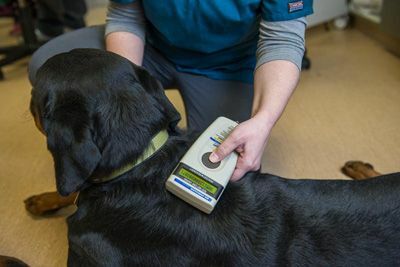 We offer the HomeAgain recovery system – our staff will place the microchip and register your information so your pet is immediately protected.